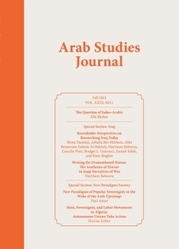 ASJ is published by the Arab Studies Institute (ASI) and is housed in the Center for Contemporary Arab Studies at Georgetown University. The contents of the Journal do not necessarily represent the opinions of either Georgetown University, the Arab Studies Institute, the Center for Contemporary Arab Studies, the editors, or the Editorial Review Board. Please see our Submissions Page for submission instructions, transliteration notes, and complete submission style requirements. All submissions must include the author's name, institutional affiliation, address, telephone number, and email address. The Journal conforms to the Chicago Manual of Style. Transliteration follows a modified International Journal of Middle East Studies system. The editors of the Arab Studies Journal reserve final editorial authority. Guidelines and deadlines for submission and advertising are available upon request. For article submissions/inquiries, please contact the Editor. For book review submissions/inquiries, please contact the Book Review Managing Editor.